Many of our seasonal campers just started out by staying with us for only a day or two. When they realized they wanted to have their favorite site whenever they wanted, for as long or short as they wanted, they decided to become seasonals. As a seasonal camper, you can come at any time of the day or night, any day of the week and stay for a day or the entire season. Your full-service hookup site includes water, 30 and 50 amp electric and a sewer connection. 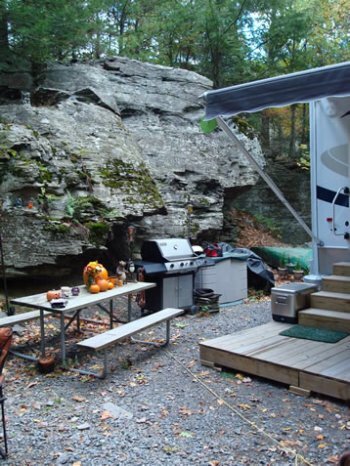 These sites are designed for RVs and there is plenty of room for slide outs and screen rooms, and of course, as with all of our sites, a table and fire ring are included. Our season starts May 1 and ends October 1. Winter on-site storage (October - May) is available for an additional charge for those who choose to leave their trailers with us. Seasonal campers have until October 15 to close down. While we don't guarantee to keep the roads open during the winter, weather permitting, you may be able to briefly visit your unit. Please call for pricing at 1-888-720-1232.